The VWBPE Conference has a number of events to support machinima endeavors for both novice users and experts. The sessions are being held at different locations on the VWBPE 20 sims built in a Steampunk motif, just for this event. 20 Sim site on SL built specifically for the event 3/17-3/19. The virtual world is of course a visual art in and of itself, but there is potential to provide learning experiences in a virtual setting that would otherwise be impossible in the real world. In my experience, the world of visual arts can be brought to students to consume in 4 ways. First the traditional way of walking around a museum and looking at the art. One of the most extensive museums in the virtual world that I have seen is the Dresden Museum on Second Life (Dresden Gallery 120,128,26), which houses 750 masterpieces of European art. An avatar can walk around the museum and see the famous art, clicking on it to get information as it is desired. This method of learning about the art mimics a strategy used in the real world. The second method takes the display and viewing of works to a different level, literally. 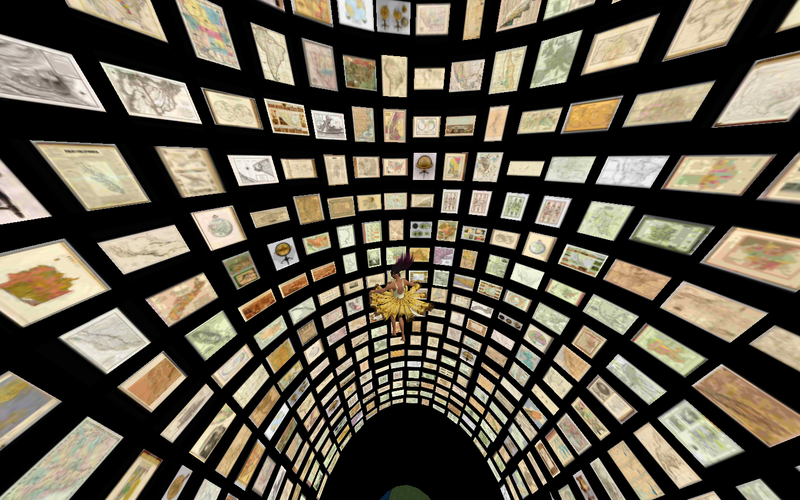 Here an avatar can view a large collection of artwork in a “museum” that can be traversed only in a virtual setting. A wonderful example of this is the Rumsey Map Museum on Second Life ( Rumsey Maps 2 (193,201,715)). The avatar visiting this museum can fly through a tower to view the extensive map collection, stopping to click on any of interest to get additional information. The third method of learning about art in a virtual setting involves becoming a part of the art. Art Box (Klaw 5,21,46) on Second Life has selected pieces of artwork with human subjects. An avatar becomes a part of a famous piece of art in Art Box. Participants are provided an opportunity to choose a painting and then click on a poseball to become the subject in the art. The owners offer props and costumes for some of the art work. Laguna Beach California has a real life, annual art show reminiscent of this strategy of enjoying art. Actors dress and pose while backdrops and lighting are used to duplicate a painting in real life. 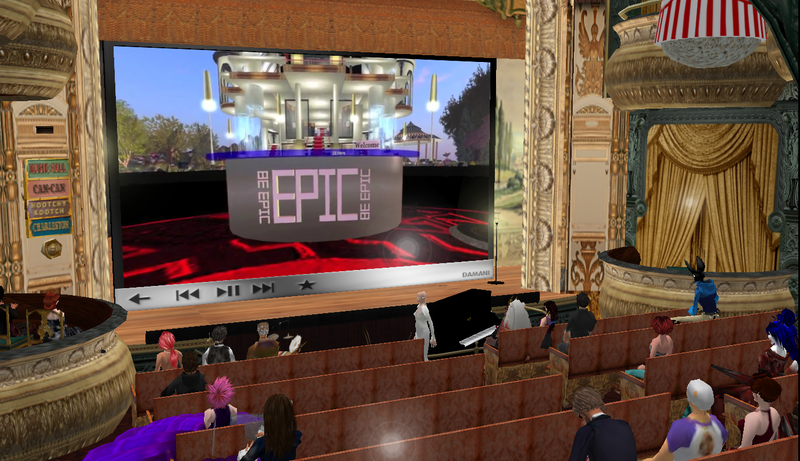 In the virtual setting the participant gets to make the art selection and become a part of it. Certainly more immersive than just looking at it. Sitting in Van Gogh's room. The builder created an elongated room to ensure groups of visitors had a correct view. Finally, an avatar can visit a location and be completely immersed in the art. In the case of Arles (168,23,29) on Second Life. 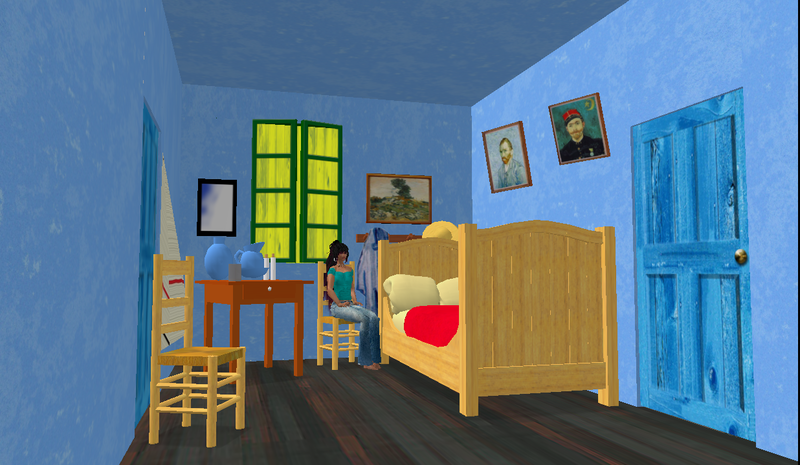 This amazing sim allows avatars to walk around Vincent Van Gogh’s paintings as they may have been seen by the artist. The paintings are a 3D form and allow complete interaction. An avatar can climb one of the famous yellow haystacks, sit in a cafe and enjoy the “starry night”, or even sit in Van Gogh’s bedroom. The many museums in the virtual environment each have policies regarding the use of the images they display. It is best to experience them by visiting the location. The places described here are not available to students under 18 years of age, but the methods may be used to create art locations in the Opensim grids so that students may interact with art and thus learn about it. Better yet, students may become the producers and create these environments with art work in the public domain or even their own art work.